I know, I know. ANOTHER fragrance review? But because I'm so picky about fragrance, I always find it blog-worthy when I find another one that I love. And there are 3 out of the ones I have been testing recently that were instant hits with me. 1. Guerlain Mon Exclusif Eau de Parfum - This is my first Guerlain perfume, though I am a huge fan of the makeup. As a lover of sweet fragrances (and sweets in general - nom), I read the description and notes online before testing it and knew I would love it immediately. Sandalwood (awesome - I live for this sandalwood scent from Nest), Toffee (yum in my fragrance and in my tummy) and lavender (is there a more calming and delightful scent? I think not.) - basically it's a trifecta of scents that come together to make magic. It's warm and sweet with a hint of floral and smells very cozy on the skin. It's definitely a "sweater weather" fragrance. 2. 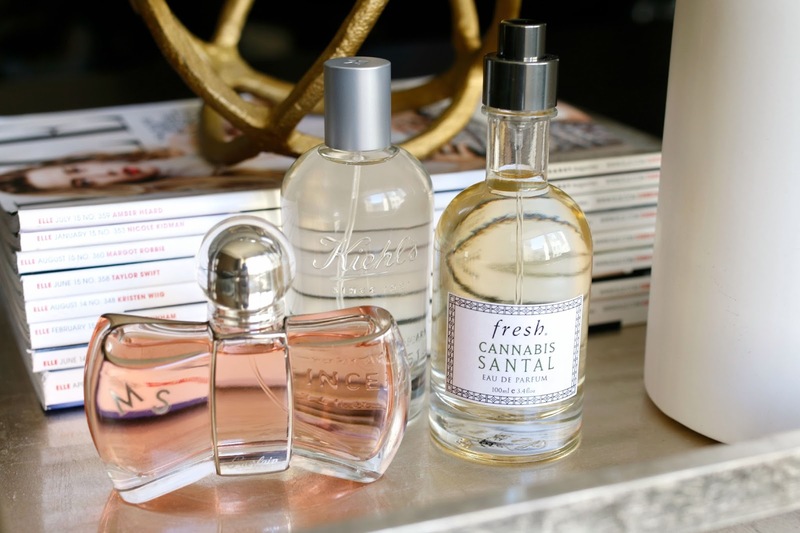 Fresh Cannabis Santal - I have had a ton of Fresh fragrances over the year - mostly the more lemon/citrus/sugar scents that they are famous for. However, during a recent meandering Sephora visit (you know those ones where you are just slowly moving from gondola to gondola picking up everything to touch it, smell it and feel it while checking your phone and not really paying attention. Just me? Oh, ok.), I wasn't even paying attention when I picked up the bottle to smell this. I stopped dead in my tracks and it was as if I was jolted out of my Sephora daze. It's a great mix of sweet (Chocolate, wild strawberries and dark plum), floral (magnolia and rose) and a woodsy musk (vanilla musk, vetiver and patchouli). It the perfect compliment to a big cashmere cardigan coat or fuzzy warm scarf. Yes, I like to pare my fragrances with an accompanying piece of clothing. 3. Kiehl's Aromatic Blends: Orange Flower and Lychee - I discovered this while at the Kiehl's flagship store recently. I believe this particular scent is only sold there but I was hooked as soon as I sprayed it on my wrist. It's a floral mix balanced with orange citrus notes that would seem way too summery for this time of year, but it deepens when on my skin making it more fall appropriate. There are other scents that are part of the Aromatic Blends collection that are available online - this one being my other favorite which surprised me because of it's patchouli notes. But the mix with rose makes it so pleasant. The ancillary body products in the Orange Flower and Lychee scent are available online but as for the fragrance it would be best to call the store and have them ship it.